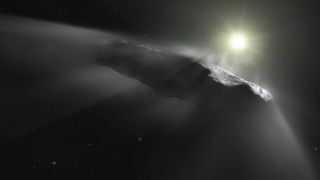 A artist's impression of 'Oumuamua, with jets coming off it as it displays comet-like behavior. The Gravity Assist Podcast is hosted by NASA's Chief Scientist, Jim Green, who each week talks to some of the greatest planetary scientists on the planet, giving a guided tour through the Solar System and beyond in the process. This week, he's joined by Dr Kelly Fast, who is the Near-Earth Object Observation Program Manager in NASA's Planetary Defense Coordination Office. Dr. Kelly Fast, who leads NASA's NEO observation program. Dr. Jim Green: To find near-Earth objects we have to scan the whole sky looking for those things that cross our orbit and that may hit our Earth one day. So, there's an array of tools that you use as part of your job. Tell us a little bit about them. Dr. Kelly Fast: Well, in th Near-Earth Objects Observations Program, the idea is to find near-Earth asteroids before they find us. Ground-based telescopes are used to survey the skies every night to look for near-Earth asteroids and try to discover the ones that haven't been seen before. Dr. Jim Green: Once you have found them, you also need to know how big they are and maybe their spin rate and some attributes of them, such as whether they're iron or stony meteorites. How do we get that kind of information? Dr. Kelly Fast: That kind of information comes from other telescopes that seek to characterize these objects. One in particular is actually a NASA telescope on the ground, the Infrared Telescope Facility on Mauna Kea on the Big Island of Hawaii. At that telescope observations are made and spectra taken in the infrared, the part of the spectrum that the eye can't see. From that information it's possible to tell something about what these asteroids are made of, which is important for understanding what sort of hazard they might pose to Earth. Dr. Jim Green: There's another new tool that looks down at the Earth and sees in-falling material. What is that telescope? Dr. Kelly Fast: It's actually an Earth Science Mission, called the GOES-16 satellite, which is looking at the Earth. There's stuff hitting the Earth all the time, but thankfully it's small material. When you look at the night sky, you see shooting stars. Those are really dust very small rocks hitting the atmosphere from outside, and they make that streak in the sky [as they burn up]. On the GOES-16 satellite is an instrument called the Geostationary Lightning Mapper, or GLM, and it's there to detect lightning—looking down at the Earth to detect lightning. But when meteors travel through the atmosphere they also create a flash of light, and the GLM is detecting those also. It turns out that there's valuable information that you can get from that. So, this is a case where you get this bonus science from a particular instrument. A speck of interplanetary dust burns up in the atmosphere as a meteor. Dr. Jim Green: What's really neat about that is, as I understand it, there's nearly 100 tons of meteoric material that falls into Earth's atmosphere every day. Dr. Kelly Fast: That's true. It sounds like a lot of material, but the atmosphere is an incredible protector for us, and so much of that just never even reaches the ground. It burns up in the atmosphere, creating beautiful shooting stars and then, if there's something that's larger, it will create something brighter such as a fireball or a bolide. Dr. Kelly Fast: We had an incredible experience in June 2018, when a very small asteroid, just a few meters in size, was discovered eight hours before it impacted the Earth Its designation was 2018 LA. Once it impacted with the Earth's atmosphere, the meteor was seen by surveillance cameras and government sensors and a meteorite was recovered afterwards. That's very important for science to connect the meteorite back to an actual asteroid whose actual orbit was determined, which tells you more about where it came from in the first place. Dr. Kelly Fast: The Pan-STARRS telescope in Hawaii was doing its normal Near-Earth Object survey operation, scanning the sky at night looking for new asteroids, and it found one, but the motion of this one was different. It was moving quite fast. And when its orbit was calculated it was realized that it had came from outside our Solar System, from interstellar space, and it was moving so fast that it was going to leave the Solar System. We call the object 'Oumuamua and to be able to come to the conclusion that this isn't one of our own asteroids was a very important discovery. Dr. Jim Green: The concept that here something that was created in another solar system and was just passing through really energized many of the ground-based astronomers and our scientists wanted to know more about it. And so, there were a lot of observations of 'Oumuamua. The Geostationary Lightning Mapper on the GOES-16 satellite is able to detect the flashes of meteors in Earth's atmosphere. Dr. Jim Green: Looking at that light over time, the best fit seems to be a cigar- or elongated-shaped object. Dr. Kelly Fast: There have been some different numbers that have come out in terms of its aspect ratio, meaning like how wide is it compared to how tall it is or its length to its width. It may be as much as 10:1 or maybe more like 5:1 or 6:1, but still something that's longer than what we've generally seen in our Solar System. There were other properties, too, that were useful for trying to understand more about this object. One thing that was seen was its color, although unfortunately it was a little too faint to take a spectrum of it, but the color still tells you something about it. And this seemed to have a reddened color, which kind of comes with space weathering, by being bombarded by radiation in space. Dr. Jim Green: What's really exciting about it is, now that we've found one, there must be others? Dr. Kelly Fast: Even before it was found, it was predicted that such objects should be passing through our solar system. So, this is probably not the only one, it's just the first one that we've seen. Dr. Jim Green: How many do we expect, now that we've seen this one? Dr. Kelly Fast: There are folks who do that kind of modeling. Some of them are saying that there should be one inside the Earth's orbit at all times. But telescopes — at least those on the ground — can only look at night so they can only cover so much of the sky. The nice thing is, since this was a pathfinder, it gave an idea of what to look for, and so it might be possible to recognize this sort of thing sooner or perhaps go into older data and look for some things that were missed. Things weren't quite exactly as they seemed at first because the people who do this sort of modeling really would have expected that this would have been an icy body like a cometary body as opposed to an asteroid. But, no coma or tail were seen when 'Oumuamua was discovered, no atmosphere that forms around as happens when the Sun heats up an icy body such as a comet. But later on, as it continued to be observed, the motion was a little odd. By very carefully measuring its motion and seeing that it was a little off, what it indicated was that this might actually be an icy body after all, because when the ice is heated on comets it produce jets when the gasses are released, and the jets can affect the object's motion, like little rocket motors on there. So it turns out that this asteroid 'Oumuamua may actually be a comet. Dr. Kelly Fast: There was a lot of discussion about this. Everybody was puzzling over this because a rubble pile object probably wouldn't have been able to hold itself together and rotate like that. So, is it like a big slab of material? And then, how would that have formed? What was its history? The presence of ice adds another piece to the puzzle. Dr. Kelly Fast: I just have to credit the people around me. I think of one in particular, Ted Kostiuk of that Goddard Space Flight Center, who I was working for after I got my Masters. And I had had kids, and I was doing science and being a mom and just loving it. He said to me one day, "I want to talk to you about the future." And he encouraged me to go back to grad school and finish my Ph.D. It led to all kinds of things that I never would have expected or planned. So that was a major, major gravity assist for me.